For certain highly loaded mechanical drive elements, such as the main rotor drive for a helicopter, it is imperative that impending failure be detected before a catastrophe occurs. A central element of the drive, such as a universal joint or coupling, will telegraph its impending failure well in advance by displaying an increase in temperature. For example, if a drive transmitting 1000 hp (750 kW) of shaft power with a universal joint loses only 0.1% in drive efficiency, the joint will increase in temperature as much as several hundred degrees until it is able to dissipate an additional 750 watts of energy as heat. This increase in temperature is a direct and reliable indication of the increased inefficiency caused by a degradation in parts performance. Monitoring the joint with an IRt/c provides a fast and direct indication of joint temperature, and thus the increasing inefficiency due to wear or failure. 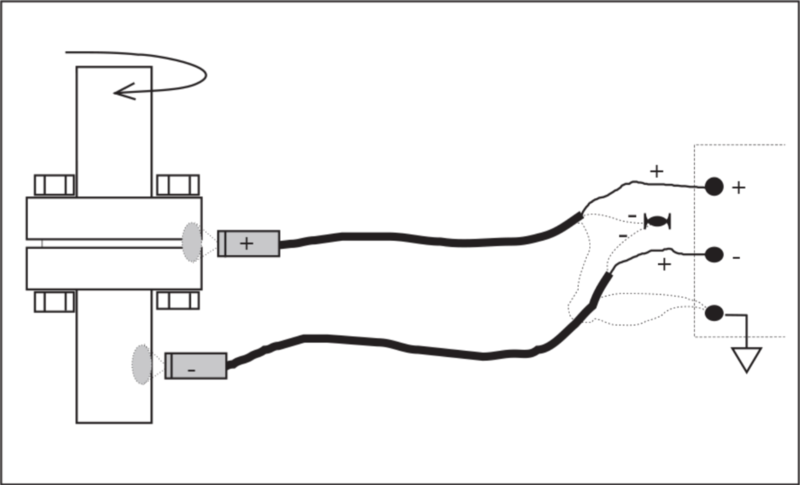 A more sensitive method of monitoring the joint is to employ two IRt/c’s wired differentially (connecting the two minus leads together and measuring across the plus leads, see example), measuring the difference in temperature between the joint and adjoining shaft. This difference is a direct measure of the heat created in the joint and will not be influenced by ambient temperature effects, since the differential pair arrangement cancels those effects. Accordingly, a very high precision can be achieved. An IRt/c with built-in air purge is recommended if the environment is oily or dusty.